SCOTTSDALE, Ariz. – December 15, 2017 – Barrett-Jackson is excited to offer a diverse selection of Ford-powered history during its 47th Annual Scottsdale Auction, January 13-21, 2018, at WestWorld of Scottsdale. The year’s premier automotive lifestyle event will include many of the most desirable Ford collectibles representing Ford’s performance heritage on both the street and track, including a 1966 Shelby GT 350 Prototype #001 (Lot #1406). Virtually any Ford provides a historical narrative. 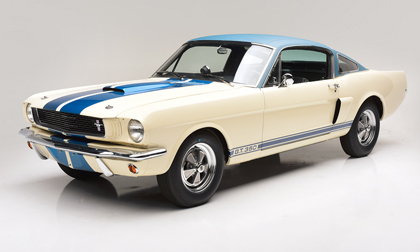 Few, however, supply the storyline of the Shelby GT350 Prototype #001 (Lot #1406). It represents the first step in what would quickly become Ford’s dragon slayer, forging a competition history that forever set the Mustang apart from the pony cars that would come after. Another notable Mustang on the docket is a 1969 Mustang Q-Code 482 Cobra Jet Convertible (Lot #1420), one of just 20 built in 1969 with a 4-speed manual transmission and one of just 50 with the 428 CJ non-Ram Air engine. Also set to cross the block is a 1955 Ford Thunderbird Custom Convertible (Lot #1417) that was a 2012 Detroit Autorama Ridler Award winner and features a Gale Banks Engineering twin-turbo engine with over 1150hp and 900 ft/lbs of torque. Today, Ford’s performance history is written with the GT and Scottsdale will feature multiple versions of the highly sought-after vehicle, including a 2006 Ford GT Heritage Edition (Lot #1414) that is one of only 343 Heritage Editions produced. Another 2006 GT, Lot #1372, is finished in Tungsten Grey and, with just over 650 actual miles, has been immaculately kept with long-term ownership by Ford racing legend Bill Kolb Jr. A 2005 GT (Lot #1425.1) is finished in Mark IV Red and is one of just 2,027 produced in 2005, displaying just under 4,000 actual miles.